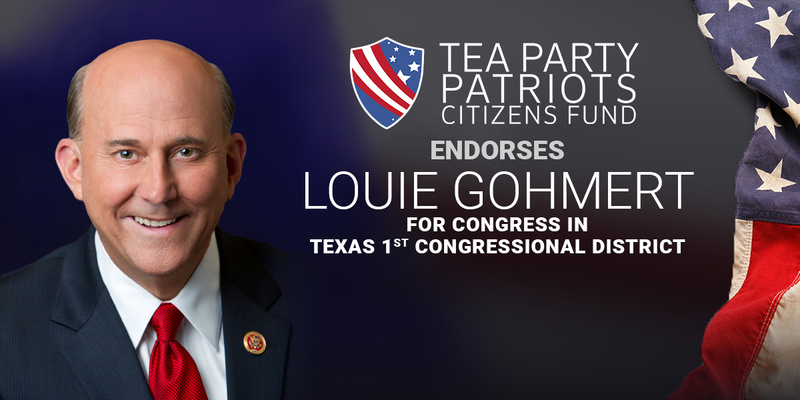 ATLANTA, Ga. – Tea Party Patriots Citizens Fund (TPPCF) Chairman Jenny Beth Martin today released the following statement, announcing that the Super PAC associated with the nation’s largest Tea Party group has endorsed Louie Gohmert for Congress in the seat representing Texas’ 1st Congressional District. “In the House of Representatives, the Tea Party movement has no stronger ally than Congressman Louie Gohmert. From the very beginning of our movement, Louie was supportive, offering his assistance whenever we needed it. More than just about any other current Member of Congress, Louie understood what motivated the grassroots, and worked to represent them on Capitol Hill. “Even more important than the help he’s given us, though, is Louie’s approach to the issues. When it comes to immigration, Louie wants to secure the borders first and foremost, and opposes amnesty. Louie wants to repeal ObamaCare, and end Congress’ illegal special exemption from the law. He opposes Common Core, and supports school choice. He fought for fundamental tax reform that will generate economic growth and create good new jobs, he supports the Penny Plan as a means to balance the budget, and he wants to stop the deficit spending. “But even more important than that, Louie has shown that he has the courage to stand up to the party bosses when the party bosses are wrong. He even offered himself as a candidate for Speaker, when conservatives were so disappointed in John Boehner’s weak leadership.